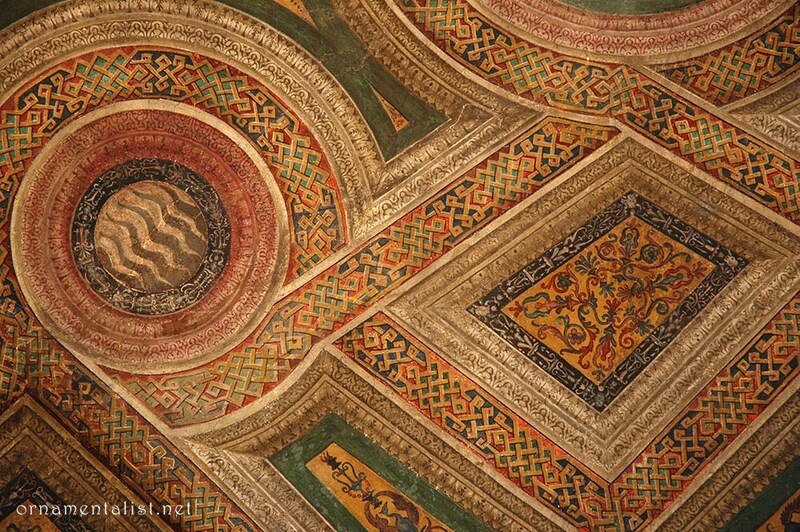 Visitors to the Vatican Museums have enough to take in without looking at all the painted borders and ornament that encrust nearly every square foot of the place. However, on my last visit, that is precisely what I was doing! 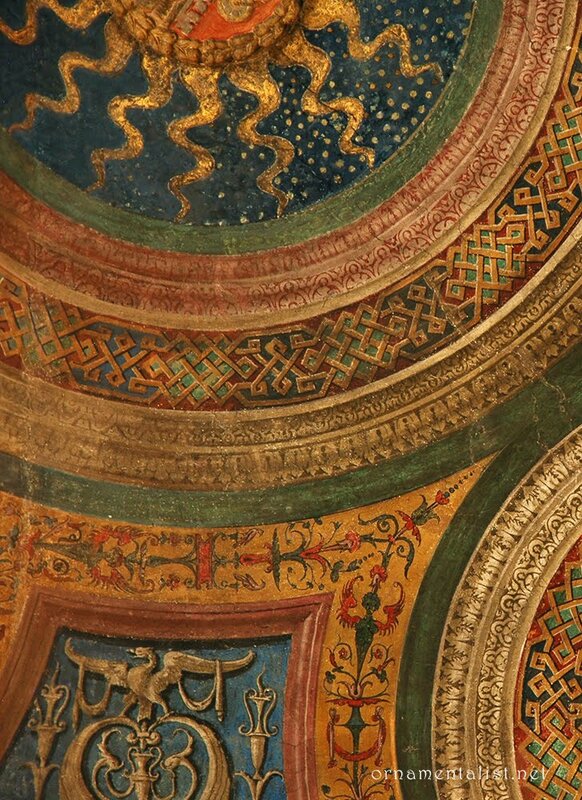 After bidding my companions not to wait for me, and after further hours of careful ceiling-gazing, I was still stopped in my tracks by two small chambers of the Salette Borgia, whose early Renaissance ornamentation is noticeably different in style than the majority of the palace. Ironically these rooms are the entrance to what is now the Collection of Modern Religious Art, which many visitors nearly run through on their way to the Sistine Chapel. <---- in the Salette Borgia: splendidly painted in jewel tones, and blissfully empty of visitors. 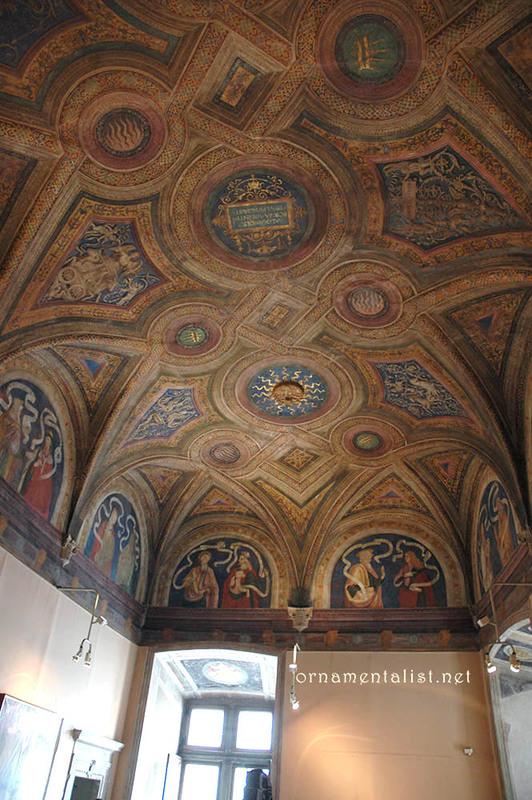 These and other parts of the Borgia Apartments were decorated with wonderful frescoes and ornament including some stylish grottesche, and fresco murals, painted in the 15th century by renown artist Pinturicchio and his sizable atelier of assistants. 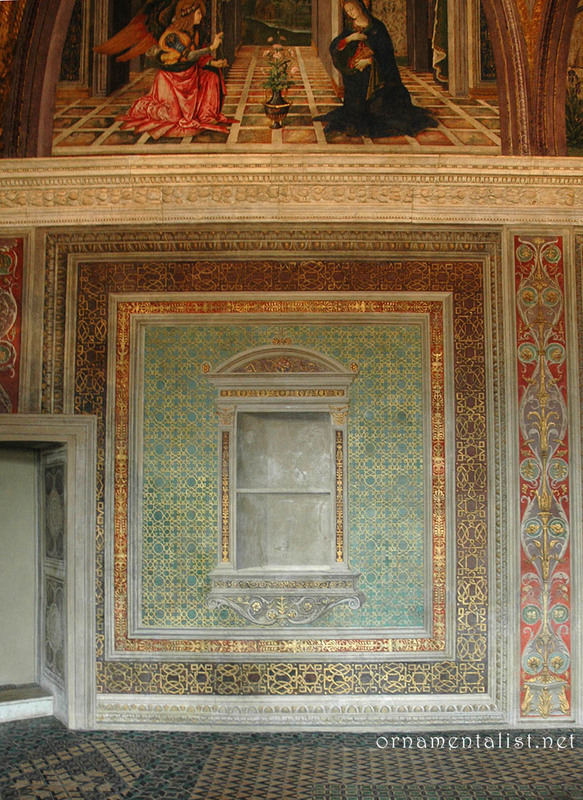 This entire suite of rooms in the Apostolic Palace was abandoned in 1503, after the death of Pope Alexander VI, because of their association with the disgraced Borgia family. Shuttered and largely disused for nearly two centuries, they escaped redecoration by later popes. worn tile floors: evidence of hundreds of thousands of visitors passing through. A wall paneled with stenciled patterns, and a trompe l'oeil window. Above it, a fresco by Pinturicchio depicting the Annunciation. 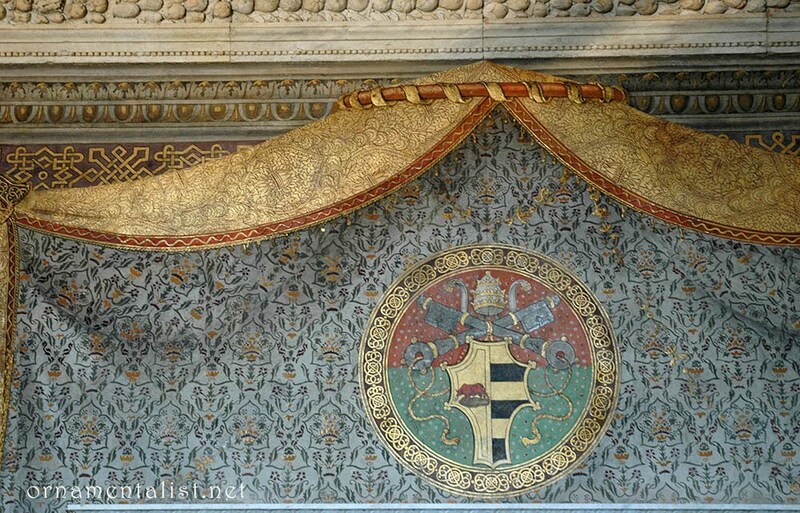 In 1891 the rooms and the artwork in them were restored under Pope Leo XIII and opened to the public. Now they seem to be treated as a mere passageway between the more famous parts of the museum... except by those of us who stop to look up. Never had the luck to visit Vatican... so thank you for the virtual tour, Lynne ! 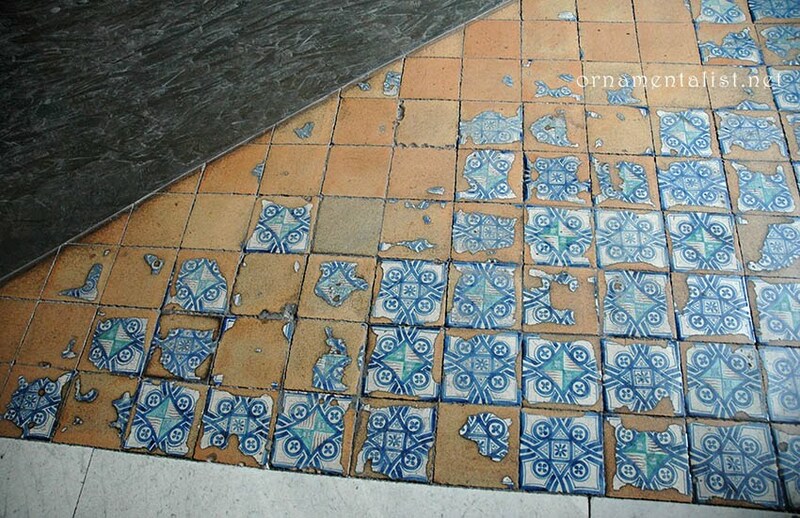 Special notice to the old tiles - very inspiring & poetic pic. total overload! that's why it's nice you can take pictures (no flash) but i wish i could go back and stay for a month in this one building studying the ornament. Lovely, divine images. It IS overload, in the best way imaginable.